The Danbury Trojan Pop Warner Youth Football/Cheer Program has flourished in Danbury for 39 years. The Trojans are part of the Danbury Athletic Youth Organization (DAYO), which offers T-Ball, Flag Football, Lacrosse, Middle School Track & Field and Basketball, plus a Speed & Agility Camp. Over the years, we have enjoyed tremendous growth and success with our programs, which can be attributed to the countless volunteers that have given their time and talents to work with the children of our community. Pop Warner Football was established over 80 years ago. The philosophy of the program is to provide the safest possible environment for children to learn the game of football by using an age-weight-controlled system, creating a level playing field for all participants. We have made provisions for players that may not be included in the Pop Warner categories by offering an Unlimited Division. This is usually reserved for middle-school students. One of our objectives is to prepare players for the high-school level but we also recognize that many children may not go on to play at that level, which is why it is so important to control weight limits for younger players. 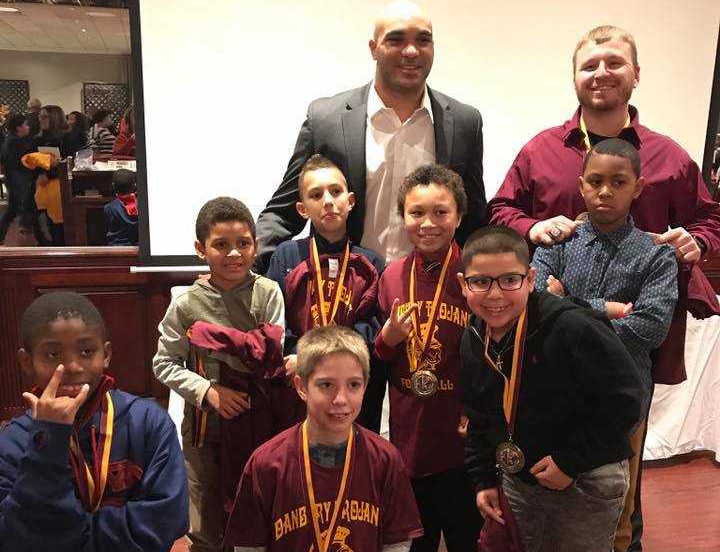 Pop Warner emphasizes excellence in the classroom through the Little Scholars Program, in which each year, children are recognized for their performance in school. DAYO’s leadership consists of members with 20-plus years of experience, and coaches with over 10 years of experience. We belong to the Southern CT Pop Warner League; they too have been in existence for over 25 years, with long-standing members. Currently, there are 18 associations that participate in our league, offering some of the most competitive youth football in the state. Additionally, all association home-field games are played on dedicated state-of-the-art facilities or hometown high-school stadiums. Our coaches apply each season for head coaching positions and they are given some autonomy in selecting assistant coaches. Many of our coaches do not have children playing. Some are past players that have come to give back to the program that helped them when they were young. All are required to participate in off-season training that includes online and hands-on clinics. Most are CPR/First-Aid Certified; all have been trained in concussion protocol. Background checks are conducted for every coach and volunteer in our program each season, including our board members. Pop Warner rules have been modified to limit the amount of practice time dedicated to full-contact drills. We provide team buses to away games, to ensure the team arrives with plenty of time to get ready for the game. Travelling together as a team with the coaches helps build better team spirit. It also removes the stress from parents having to deal with traffic and finding the away field location. The game of football is an emotional and challenging sport that requires dedication and commitment by players, coaches and parents in order to be successful. Although we have had many winning squads over the years, it is not just about winning. If you properly train, practice and prepare, you will have your share of wins but more importantly, learning sportsmanship, teamwork and dedication, doing well in school and developing a love of the game are other measures of success. If your children play one season of football, they will perform at a higher level in whatever sport they play next. They will gain confidence in themselves, increase their self-esteem and develop new friendships. DAYO is committed to academic excellence and is part of the Pop Warner Little Scholars Program. Each year, we have our players and cheerleaders recognized on a national level for their achievements in the classroom and the community. Participation by your child in any of our programs, throughout their eligibility, will allow them to apply for one of the four scholarships awarded each year to graduating seniors who plan to continue their education. Many of our players have gone on to play in high school and some in college. We are proud to mention that Austin Calitro, an NFL Football Player, is a former Trojan Football Player. A number of our coaches have gone on to coach in high school and beyond. We are proud of our accomplishments and we are constantly striving to improve in as many ways as possible. Become part of the Trojan Tradition; it can be a rewarding experience for both you and your child. Get involved with DAYO – we are always looking for people to volunteer and become part of our DAYO family. Contact us at dayoinfo@aol.com with any questions. For additional information, please call Estela Camacho at 203-530-2457 or email her at EstelaGC005@gmail.com. You can also learn more about the organization at www.dayosports.com, Facebook: Danbury Athletic Youth Organization, Twitter: @DAYOinfosports or read about us in Tribuna Newspaper.